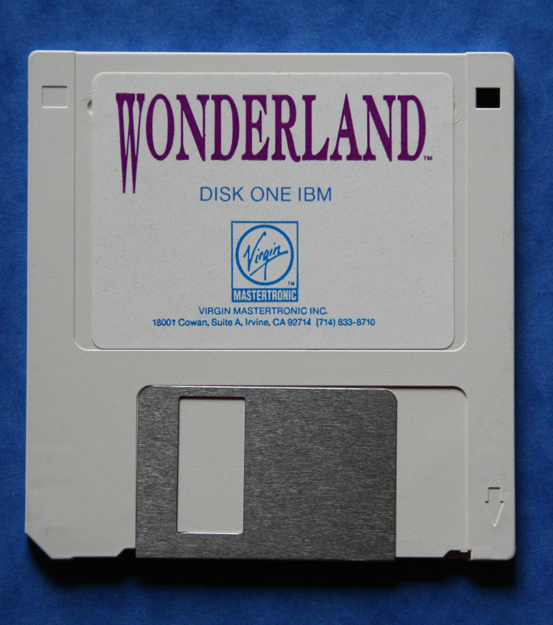 EVERYONE HAS READ WONDERLAND...BUT ONLY ONE HAS DREAMED IT... UNTIL NOW! 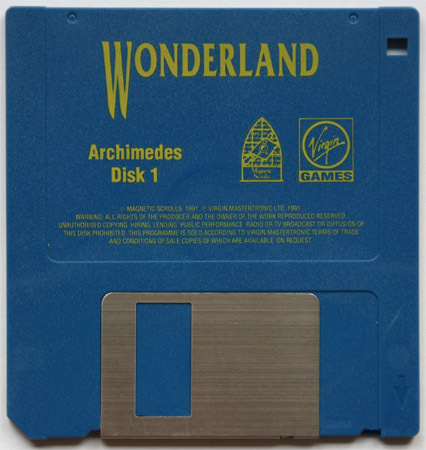 Here, too, you will be confronted by puzzles, puns, and conundrums, potions and mushrooms, a giant puppy and a miniature tunnel, and challenges enough to keep you within Wonderland's perplexing and magical domains for hundreds of hours. 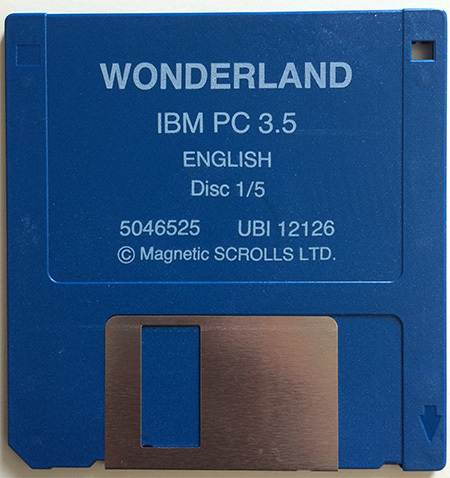 Wonderland - written in Magnetic Windows, the radical new adventuring environment from Magnetic Scrolls - gives you over 100 stunning graphics, many of them animated... but that's not all. A mouse click on an illustration reveals information about the objects shown. Pop-up menus of appropriate commands let you play with a minimum of typing. On-screen maps and help, multiple windows, and icons for every object and room in the adventure combine to make the most sophisticated environment ever created. It all helps, but in the end it's down to you. Have you the dreampower to dream your way through wonderland ? Attend the Mad Hatter's absurd tea party. Meet the caterpillar perched upon his mushrooms, puffing away on his hookah. Drop in on the duchess (is that a baby or a piglet she is holding?) and her temperamental cook. You, as Alice, face a plethora of puzzles, puns and conundrums. Like how to assist the royal gardeners in painting the roses red before the Queen of Hearts arrives to inspect them. Challenges to perplex and enchant you for hundreds of hours. "The game is neither strictly a text adventure nor can it be described as a graphic adventure. It is its own genre... 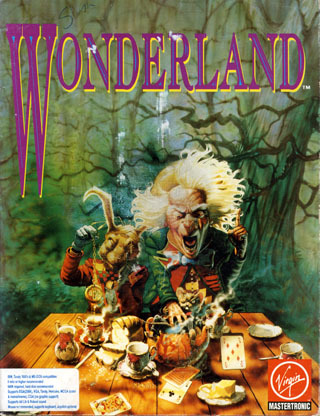 The game uses multi-tasking to offer an incredible array of features..."
Besides superb graphics and sound support, Wonderland's unique windowing environment offers pull-down verb and noun menus, graphics you can size up or down and move around the screen, automated mapping, point-and-click object manipulation, a compass for directional movement, and extensive on-screen help. 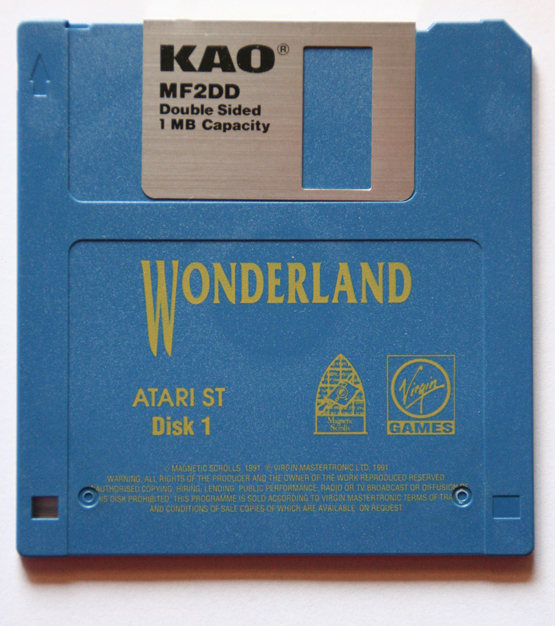 "Innovative," "ambitious" (The Chicago Tribune), "exquisite and impressive" (CGW), "brilliant and insane" (The Electronic Gamer), are more words used to describe Wonderland. Questbusters calls its windowed universe "the ultimate interface." 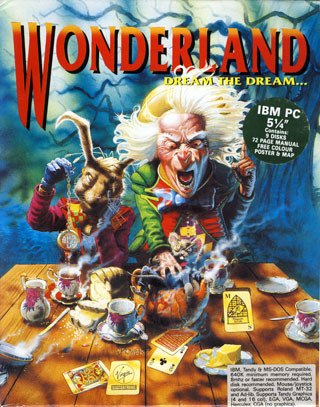 Stunning graphics, impressive sound board support and a captivating story, all in a sophisticated new windowing system, combine to make Wonderland the richest adventure ever: a game to play, to tell, and to inhabit. Separate boxes for European (18.3 cm x 23 cm - 7.25" x 9") and US market (17.8 cm x 23 cm - 7" x 9"), similiar in extents, but vary in colouring and detail. Besides there finds one subtle difference (have a close look at the playing cards...). 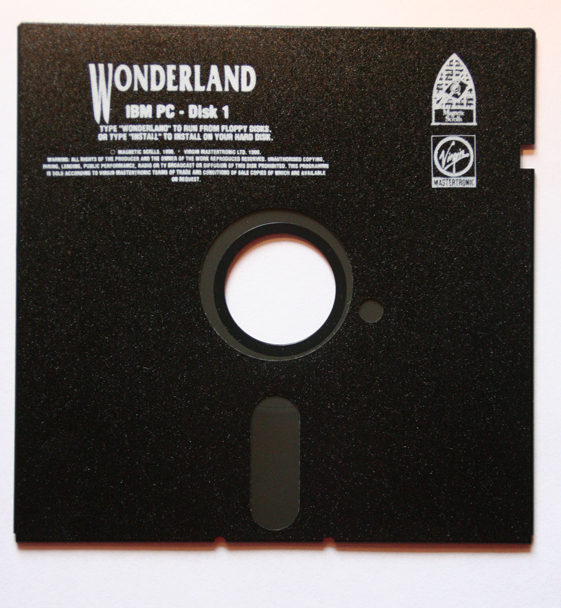 The contents of the U.S. box were wrapped in a Virgin/Mastertronic sleeve. The US boxes came in two different flavours: A slipcased box and a two-piece-box. 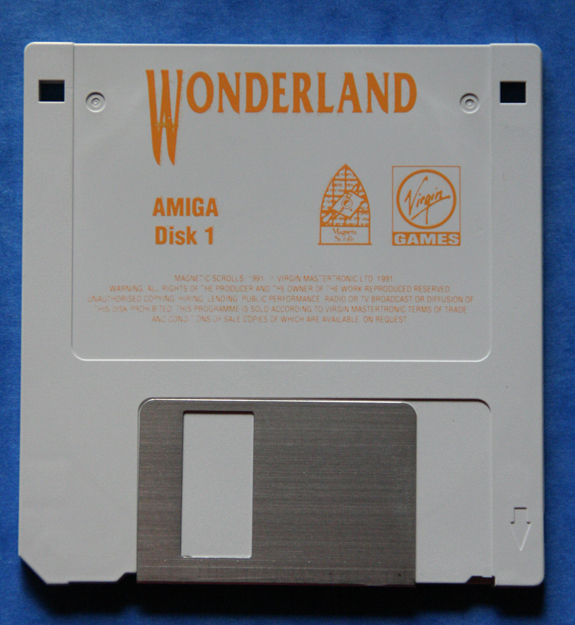 This game introduced the "Magnetic Windows" system, featuring a graphical user interface and a slightly enhanced interpreter. 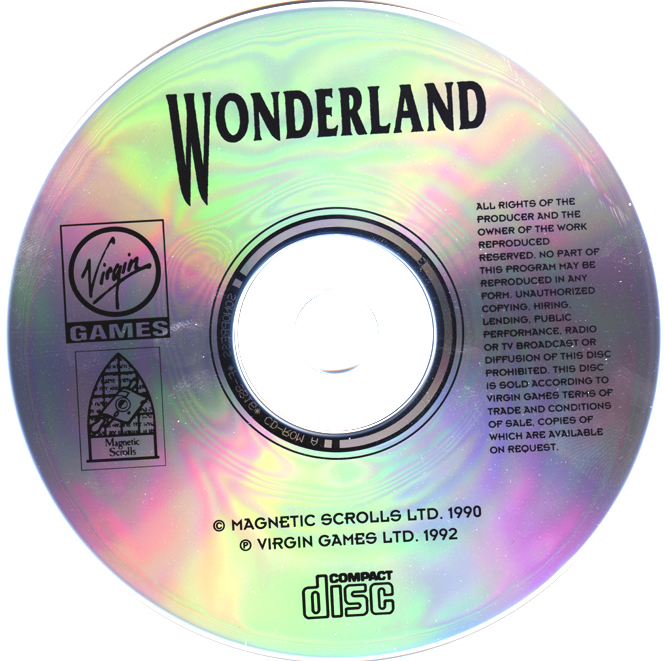 While the U.S. version of the game package does not show the "Magnetic Scrolls play card" on the front cover and the game subtitle is changed to "Live the dream", the included game manual is identical to the European version except for the binding of the book and thus showing the play card and the "Dream the Dream" headline. 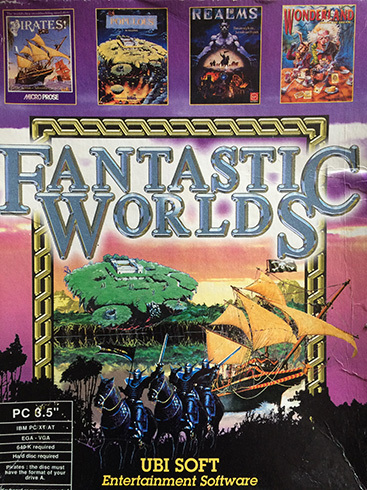 Wonderland was part of Ubisoft's Fantastic Worlds compilation.